Not to be confused with Actin. Actinium is a chemical element with symbol Ac and atomic number 89. It was first isolated by French chemist André-Louis Debierne in 1899. Friedrich Oskar Giesel later independently isolated it in 1902 and, unaware that it was already known, gave it the name emanium. Actinium gave the name to the actinide series, a group of 15 similar elements between actinium and lawrencium in the periodic table. It is also sometimes considered the first of the 7th-period transition metals, although lawrencium is less commonly given that position. Together with polonium, radium, and radon, actinium was one of the first non-primordial radioactive elements to be isolated. A soft, silvery-white radioactive metal, actinium reacts rapidly with oxygen and moisture in air forming a white coating of actinium oxide that prevents further oxidation. As with most lanthanides and many actinides, actinium assumes oxidation state +3 in nearly all its chemical compounds. Actinium is found only in traces in uranium and thorium ores as the isotope 227Ac, which decays with a half-life of 21.772 years, predominantly emitting beta and sometimes alpha particles, and 228Ac, which is beta active with a half-life of 6.15 hours. 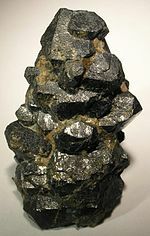 One tonne of natural uranium in ore contains about 0.2 milligrams of actinium-227, and one tonne of thorium contains about 5 nanograms of actinium-228. The close similarity of physical and chemical properties of actinium and lanthanum makes separation of actinium from the ore impractical. Instead, the element is prepared, in milligram amounts, by the neutron irradiation of 226Ra in a nuclear reactor. Owing to its scarcity, high price and radioactivity, actinium has no significant industrial use. Its current applications include a neutron source and an agent for radiation therapy targeting cancer cells in the body and killing them. André-Louis Debierne, a French chemist, announced the discovery of a new element in 1899. He separated it from pitchblende residues left by Marie and Pierre Curie after they had extracted radium. In 1899, Debierne described the substance as similar to titanium and (in 1900) as similar to thorium. Friedrich Oskar Giesel independently discovered actinium in 1902 as a substance being similar to lanthanum and called it "emanium" in 1904. After a comparison of the substances half-lives determined by Debierne, Harriet Brooks in 1904, and Otto Hahn and Otto Sackur in 1905, Debierne's chosen name for the new element was retained because it had seniority, despite the contradicting chemical properties he claimed for the element at different times. Articles published in the 1970s and later suggest that Debierne's results published in 1904 conflict with those reported in 1899 and 1900. Furthermore, the now-known chemistry of actinium precludes its presence as anything other than a minor constituent of Debierne's 1899 and 1900 results; in fact, the chemical properties he reported make it likely that he had, instead, accidentally identified protactinium, which would not be discovered for another fourteen years, only to have it disappear due to its hydrolysis and adsorption onto his laboratory equipment. This has led some authors to advocate that Giesel alone should be credited with the discovery. A less confrontational vision of scientific discovery is proposed by Adloff. He suggests that hindsight criticism of the early publications should be mitigated by the then nascent state of radiochemistry: highlighting the prudence of Debierne's claims in the original papers, he notes that nobody can contend that Debierne's substance did not contain actinium. Debierne, who is now considered by the vast majority of historians as the discoverer, lost interest in the element and left the topic. Giesel, on the other hand, can rightfully be credited with the first preparation of radiochemically pure actinium and with the identification of its atomic number 89. Actinium reacts rapidly with oxygen and moisture in air forming a white coating of actinium oxide that impedes further oxidation. As with most lanthanides and actinides, actinium exists in the oxidation state +3, and the Ac3+ ions are colorless in solutions. The oxidation state +3 originates from the [Rn]6d17s2 electronic configuration of actinium, with three valence electrons that are easily donated to give the stable closed-shell structure of the noble gas radon. The rare oxidation state +2 is only known for actinium dihydride (AcH2); even this may in reality be an electride compound like its lighter congener LaH2 and thus have actinium(III). Ac3+ is the largest of all known tripositive ions and its first coordination sphere contains approximately 10.9 ± 0.5 water molecules. Only a limited number of actinium compounds are known including AcF3, AcCl3, AcBr3, AcOF, AcOCl, AcOBr, Ac2S3, Ac2O3 and AcPO4, due to actinium's intense radioactivity. Except for AcPO4, they are all similar to the corresponding lanthanum compounds. They all contain actinium in the oxidation state +3. In particular, the lattice constants of the analogous lanthanum and actinium compounds differ by only a few percent. Actinium is found only in traces in uranium ores – one tonne of uranium in ore contains about 0.2 milligrams of 227Ac – and in thorium ores, which contain about 5 nanograms of 228Ac per one tonne of thorium. The actinium isotope 227Ac is a transient member of the uranium-actinium series decay chain, which begins with the parent isotope 235U (or 239Pu) and ends with the stable lead isotope 207Pb. The isotope 228Ac is a transient member of the thorium series decay chain, which begins with the parent isotope 232Th and ends with the stable lead isotope 208Pb. Another actinium isotope (225Ac) is transiently present in the neptunium series decay chain, beginning with 237Np (or 233U) and ending with thallium (205Tl) and near-stable bismuth (209Bi); even though all primordial 237Np has decayed away, it is continuously produced by neutron knock-out reactions on natural 238U. The low natural concentration, and the close similarity of physical and chemical properties to those of lanthanum and other lanthanides, which are always abundant in actinium-bearing ores, render separation of actinium from the ore impractical, and complete separation was never achieved. [dubious – discuss] Instead, actinium is prepared, in milligram amounts, by the neutron irradiation of 226Ra in a nuclear reactor. 225Ac is applied in medicine to produce 213Bi in a reusable generator or can be used alone as an agent for radiation therapy, in particular targeted alpha therapy (TAT). This isotope has a half-life of 10 days, making it much more suitable for radiation therapy than 213Bi (half-life 46 minutes). Additionally, 225Ac decays to nontoxic 209Bi rather than stable but toxic lead, which is the final product in the decay chains of several other candidate isotopes, namely 227Th, 228Th, and 230U. Not only 225Ac itself, but also its daughters, emit alpha particles which kill cancer cells in the body. The major difficulty with application of 225Ac was that intravenous injection of simple actinium complexes resulted in their accumulation in the bones and liver for a period of tens of years. As a result, after the cancer cells were quickly killed by alpha particles from 225Ac, the radiation from the actinium and its daughters might induce new mutations. To solve this problem, 225Ac was bound to a chelating agent, such as citrate, ethylenediaminetetraacetic acid (EDTA) or diethylene triamine pentaacetic acid (DTPA). This reduced actinium accumulation in the bones, but the excretion from the body remained slow. Much better results were obtained with such chelating agents as HEHA (1,4,7,10,13,16-hexaazacyclohexadecane-N,N′,N″,N‴,N‴′,N‴″-hexaacetic acid) or DOTA (1,4,7,10-tetraazacyclododecane-1,4,7,10-tetraacetic acid) coupled to trastuzumab, a monoclonal antibody that interferes with the HER2/neu receptor. The latter delivery combination was tested on mice and proved to be effective against leukemia, lymphoma, breast, ovarian, neuroblastoma and prostate cancers. The medium half-life of 227Ac (21.77 years) makes it very convenient radioactive isotope in modeling the slow vertical mixing of oceanic waters. The associated processes cannot be studied with the required accuracy by direct measurements of current velocities (of the order 50 meters per year). However, evaluation of the concentration depth-profiles for different isotopes allows estimating the mixing rates. The physics behind this method is as follows: oceanic waters contain homogeneously dispersed 235U. Its decay product, 231Pa, gradually precipitates to the bottom, so that its concentration first increases with depth and then stays nearly constant. 231Pa decays to 227Ac; however, the concentration of the latter isotope does not follow the 231Pa depth profile, but instead increases toward the sea bottom. This occurs because of the mixing processes which raise some additional 227Ac from the sea bottom. Thus analysis of both 231Pa and 227Ac depth profiles allows researchers to model the mixing behavior. There are theoretical predictions that AcHx hydrides (in this case with very high pressure) are a candidate for a near room-temperature superconductor as they have Tc significantly higher than H3S, possibly near 250 K.
227Ac is highly radioactive and experiments with it are carried out in a specially designed laboratory equipped with a tight glove box. When actinium trichloride is administered intravenously to rats, about 33% of actinium is deposited into the bones and 50% into the liver. Its toxicity is comparable to, but slightly lower than that of americium and plutonium. For trace quantities, fume hoods with good aeration suffice; for gram amounts, hot cells with shielding from the intense gamma radiation emitted by 227Ac are necessary. ^ Wall, Greg (8 September 2003). "C&EN: It's Elemental: The Periodic Table - Actinium". C&EN: It's Elemental: The Periodic Table. Chemical and Engineering News. Retrieved 2 June 2011. ^ a b c d e f Kirby, Harold W.; Morss, Lester R. (2006). "Actinium". The Chemistry of the Actinide and Transactinide Elements. p. 18. doi:10.1007/1-4020-3598-5_2. ISBN 978-1-4020-3555-5. ^ "Actinium - Element information, properties and uses". Royal Society of Chemistry. Retrieved 25 October 2018. ^ Debierne, André-Louis (1899). "Sur un nouvelle matière radio-active". Comptes Rendus (in French). 129: 593–595. ^ Debierne, André-Louis (1900–1901). "Sur un nouvelle matière radio-actif – l'actinium". Comptes Rendus (in French). 130: 906–908. ^ Giesel, Friedrich Oskar (1902). "Ueber Radium und radioactive Stoffe". Berichte der Deutschen Chemischen Gesellschaft (in German). 35 (3): 3608–3611. doi:10.1002/cber.190203503187. ^ Giesel, Friedrich Oskar (1904). "Ueber den Emanationskörper (Emanium)". Berichte der Deutschen Chemischen Gesellschaft (in German). 37 (2): 1696–1699. doi:10.1002/cber.19040370280. ^ Debierne, André-Louis (1904). "Sur l'actinium". Comptes Rendus (in French). 139: 538–540. ^ Giesel, Friedrich Oskar (1904). "Ueber Emanium". Berichte der Deutschen Chemischen Gesellschaft (in German). 37 (2): 1696–1699. doi:10.1002/cber.19040370280. ^ Giesel, Friedrich Oskar (1905). "Ueber Emanium". Berichte der Deutschen Chemischen Gesellschaft (in German). 38 (1): 775–778. doi:10.1002/cber.190503801130. ^ a b Kirby, Harold W. (1971). "The Discovery of Actinium". Isis. 62 (3): 290–308. doi:10.1086/350760. JSTOR 229943. ^ a b c Adloff, J. P. (2000). "The centenary of a controversial discovery: actinium". Radiochim. Acta. 88 (3–4_2000): 123–128. doi:10.1524/ract.2000.88.3-4.123. ^ a b c Hammond, C. R. The Elements in Lide, D. R., ed. (2005). CRC Handbook of Chemistry and Physics (86th ed.). Boca Raton (FL): CRC Press. ISBN 0-8493-0486-5. ^ Gilley, Cynthia Brooke; University of California, San Diego. Chemistry (2008). New convertible isocyanides for the Ugi reaction; application to the stereoselective synthesis of omuralide. ProQuest. p. 11. ISBN 978-0-549-79554-4. ^ Reimers, Jeffrey R. (2011). Computational Methods for Large Systems: Electronic Structure Approaches for Biotechnology and Nanotechnology. John Wiley and Sons. p. 575. ISBN 978-0-470-48788-4. ^ a b c d Stites, Joseph G.; Salutsky, Murrell L.; Stone, Bob D. (1955). "Preparation of Actinium Metal". J. Am. Chem. Soc. 77 (1): 237–240. doi:10.1021/ja01606a085. ^ Richard A. Muller (2010). Physics and Technology for Future Presidents: An Introduction to the Essential Physics Every World Leader Needs to Know. Princeton University Press. pp. 136–. ISBN 978-0-691-13504-5. ^ Katz, J. J.; Manning, W. M. (1952). "Chemistry of the Actinide Elements Annual Review of Nuclear Science". Annual Review of Nuclear Science. 1: 245–262. Bibcode:1952ARNPS...1..245K. doi:10.1146/annurev.ns.01.120152.001333. ^ a b c Farr, J.; Giorgi, A. L.; Bowman, M. G.; Money, R. K. (1961). "The crystal structure of actinium metal and actinium hydride". Journal of Inorganic and Nuclear Chemistry. 18: 42–47. doi:10.1016/0022-1902(61)80369-2. ^ Ferrier, Maryline G.; Stein, Benjamin W.; Batista, Enrique R.; Berg, John M.; Birnbaum, Eva R.; Engle, Jonathan W.; John, Kevin D.; Kozimor, Stosh A.; Lezama Pacheco, Juan S.; Redman, Lindsay N. (2017). "Synthesis and Characterization of the Actinium Aquo Ion". ACS Central Science. 3 (3): 176–185. doi:10.1021/acscentsci.6b00356. PMC 5364452. PMID 28386595. ^ a b c d e f g h i j k l m n o Fried, Sherman; Hagemann, French; Zachariasen, W. H. (1950). "The Preparation and Identification of Some Pure Actinium Compounds". Journal of the American Chemical Society. 72 (2): 771–775. doi:10.1021/ja01158a034. ^ a b Zachariasen, W. H. (1949). "Crystal chemical studies of the 5f-series of elements. XII. New compounds representing known structure types". Acta Crystallographica. 2 (6): 388–390. doi:10.1107/S0365110X49001016. ^ Zachariasen, W. H. (1949). "Crystal chemical studies of the 5f-series of elements. VI. The Ce2S3-Ce3S4 type of structure" (PDF). Acta Crystallographica. 2: 57–60. doi:10.1107/S0365110X49000126. ^ a b Zachariasen, W. H. (1948). "Crystal chemical studies of the 5f-series of elements. I. New structure types". Acta Crystallographica. 1 (5): 265–268. doi:10.1107/S0365110X48000703. ^ a b Hagemann, French (1950). "The Isolation of Actinium". Journal of the American Chemical Society. 72 (2): 768–771. doi:10.1021/ja01158a033. ^ a b Greenwood, Norman N.; Earnshaw, Alan (1997). Chemistry of the Elements (2nd ed.). Butterworth-Heinemann. p. 946. ISBN 978-0-08-037941-8. ^ Emeleus, H. J. (1987). Advances in inorganic chemistry and radiochemistry. Academic Press. pp. 16–. ISBN 978-0-12-023631-2. ^ a b Bolla, Rose A.; Malkemus, D.; Mirzadeh, S. (2005). "Production of actinium-225 for alpha particle mediated radioimmunotherapy". Applied Radiation and Isotopes. 62 (5): 667–679. doi:10.1016/j.apradiso.2004.12.003. PMID 15763472. ^ Melville, G; Allen, Bj (2009). "Cyclotron and linac production of Ac-225". Applied Radiation and Isotopes. 67 (4): 549–55. doi:10.1016/j.apradiso.2008.11.012. PMID 19135381. ^ a b c Deblonde, Gauthier J.-P.; Abergel, Rebecca J. (21 October 2016). "Active actinium". Nature Chemistry. 8 (11): 1084. doi:10.1038/nchem.2653. ISSN 1755-4349. PMID 27768109. ^ Dixon, W. R.; Bielesch, Alice; Geiger, K. W. (1957). "Neutron Spectrum of an Actinium–Beryllium Source". Can. J. Phys. 35 (6): 699–702. Bibcode:1957CaJPh..35..699D. doi:10.1139/p57-075. ^ Deal K.A. ; Davis I.A. ; Mirzadeh S.; Kennel S.J. & Brechbiel M.W. (1999). "Improved in Vivo Stability of Actinium-225 Macrocyclic Complexes". J Med Chem. 42 (15): 2988–9. doi:10.1021/jm990141f. PMID 10425108. ^ McDevitt, Michael R.; Ma, Dangshe; Lai, Lawrence T.; et al. (2001). "Tumor Therapy with Targeted Atomic Nanogenerators". Science. 294 (5546): 1537–1540. Bibcode:2001Sci...294.1537M. doi:10.1126/science.1064126. PMID 11711678. ^ Borchardt, Paul E.; et al. (2003). "Targeted Actinium-225 in Vivo Generators for Therapy of Ovarian Cancer" (PDF). Cancer Research. 63 (16): 5084–5090. PMID 12941838. ^ Ballangrud, A. M.; et al. (2004). "Alpha-particle emitting atomic generator (Actinium-225)-labeled trastuzumab (herceptin) targeting of breast cancer spheroids: efficacy versus HER2/neu expression". Clinical Cancer Research. 10 (13): 4489–97. doi:10.1158/1078-0432.CCR-03-0800. PMID 15240541. ^ Nozaki, Yoshiyuki (1984). "Excess 227Ac in deep ocean water". Nature. 310 (5977): 486–488. Bibcode:1984Natur.310..486N. doi:10.1038/310486a0. ^ Geibert, W.; Rutgers Van Der Loeff, M. M.; Hanfland, C.; Dauelsberg, H.-J. (2002). "Actinium-227 as a deep-sea tracer: sources, distribution and applications". Earth and Planetary Science Letters. 198 (1–2): 147–165. Bibcode:2002E&PSL.198..147G. doi:10.1016/S0012-821X(02)00512-5. ^ Semenok, Dmitrii V. et al. https://arxiv.org/abs/1802.05676 "Actinium hydrides AcH10, AcH12, AcH16 as high-temperature conventional superconductors"
^ Langham, W.; Storer, J. (1952). "Toxicology of Actinium Equilibrium Mixture". Los Alamos Scientific Lab. : Technical Report. doi:10.2172/4406766. Actinium in Kirby, H. W.; Morss, L. R. (2006). Morss; Edelstein, Norman M.; Fuger, Jean (eds.). The Chemistry of the Actinide and Transactinide Elements (3rd ed.). Dordrecht, The Netherlands: Springer. ISBN 978-1-4020-3555-5.